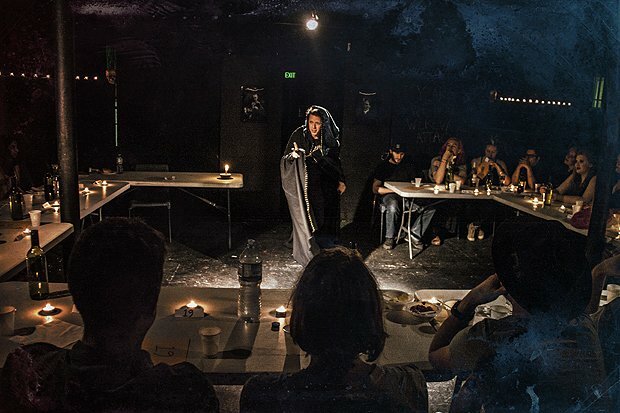 Jon Gracey's Werewolf: Live will wholeheartedly live or die on the strength of its crowd. Eight audience members are invited on stage where they're assigned the roles of villagers, one of two werewolves or the resident seer. The aim of the game is to catch the werewolves and save the villagers, with all the drama playing out to hopefully create some comedy. A Saturday night on the Cowgate brings a mixture of devoted fans, highly inebriated extroverts and straight-up hecklers. The first game seems to confuse and frustrate the third group, so rather than contribute they antagonise and offer worthless contributions. When they eventually leave, they are missed by no one. One of our eight villagers, despite warnings to the contrary, repeatedly bashes a table that looks to be constantly on the verge of collapsing. Whatever I expected, it wasn't tension of this kind, but it's highly watchable despite the chaos. By the time a third game comes around, a balance is struck and it's clear how good a night out Werewolf: Live can be. A former Beta Male, Gracey is a quick-witted host and on the right occasion this show will soar. A charity one-off later in the month that features Nish Kumar, Marcus Brigstocke and Luisa Omielan might be a good place to start. Werewolf: Live, Underbelly Cowgate, until 26 Aug (not 21), 10.50pm, £9–£10 (£8–£9); Werewolf: Live – Charity Spectacular, Underbelly George Square, 21 Aug, 11.30pm, £15 (£14).